Happy Spring Training Opener to everyone who is ready to say goodbye to Winter! While this project continues to bring a smile to my face, I’m definitely ready to see players wearing numbers in the 80’s and 90’s chasing their dream. 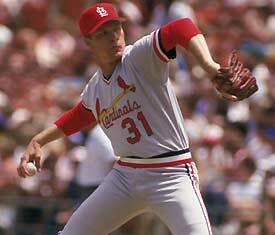 Not that long ago, Lynn was one of those pitchers who broke into the majors with a #62 on his back. Now a co-ace after his best season yet, Lynn was rewarded with an extension and can look to his St. Louis predecessors for insight. Brecheen and Forsch both resided in the Cardinals’ rotation for the better part of a decade, and this should be the only goal Lynn strives for going forward. I’ll be the first to admit being completely wrong about Lynn’s ability to become the starter he is now, and I hope he has as long a tenure as Forsch wearing the Birds on the Bat. Durability should be rewarded more than it is currently even if flash and fanfare get more attention. I’ll take consistent from a starting rotation any day, so St. Louis definitely can look to the future inductee of the Cards’ Hall of Fame for inspiration. Learning from another former #31 in Gibson, Forsch took over the mantle as workhorse in the mid-70’s and didn’t stop leading the staff until after a third World Series appearance in 1987. He toed the rubber over 400 times in 15 seasons, including ten campaigns of 30 or more starts. While numbers never tell the whole story, Forsch gave everything he had without an overpowering arsenal at his disposal. Seven seasons he completed more than 210 innings and finished what he started 67 times as a Cardinal. In a pair of those complete games, Forsch etched his name in the record books by tossing no-hitters and becoming the only St. Louis hurler with more than one. It was certainly a long drought between postseason appearances for the storied franchise heading into 1982. We have highlighted many of the pieces Whitey put together on this countdown with plenty more to come, but none of the World Series heroics would have been possible without Forsch’s NLCS debut. In the rout of Atlanta, the homegrown star not only dominated the Braves with a three-hitter in Game 1 but put the rest of baseball on notice that the Cardinals were back. And with another hurler wearing the 31, the future is bright as long as Lynn keeps the tradition alive.